Fantastically ventilated with 31 inlets, and completely aerodynamic with its removable aero shells, The One® is also perfectly designed to hold your sunglasses in its ‘Sunglasses Garage’ if you remove them during the race. With a focus on safety, The One® features a Bollé exclusive SAFETY QR Code and a specially-designed BOLLÉ LED. Its Click-to-Fit™ System ensures a perfect adjustable fit and its interchangeable winter and summer linings allow for year-round use. Complete with a detachable visor for mountain biking, The One® offers you everything you need in a cycling helmet. Our removable aero shells allow you to adjust helmet ventilation and aerodynamics. Completely ventilated with 31 partially or wholly covered inlets, you now have a real choice, thanks to The One. The One and Messenger put the emphasis on safety. In case of an accident, Safety QR Code allows any person equipped with a smartphone that can read QR codes, to identify who exactly should be contacted and what should be done, thanks to a voice message recorded beforehand. This BOLLE exclusive option makes your outings safer. For those who prefer the road but, from time to time, head off the beaten track, The One helmet is also delivered with a removable mountain bike visor. You can use the same helmet on- and off-road. 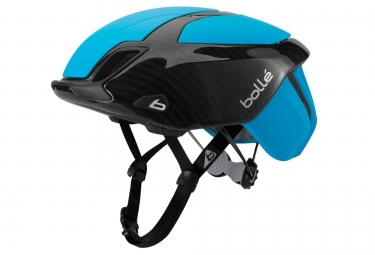 Casque Bollé THE ONE ROAD PREMIUM 2016 Bleu Carbon clasificado 4.4 de 5 por 16.